My apologies, I’m having computer problems that are preventing me from uploading pictures to WordPress. 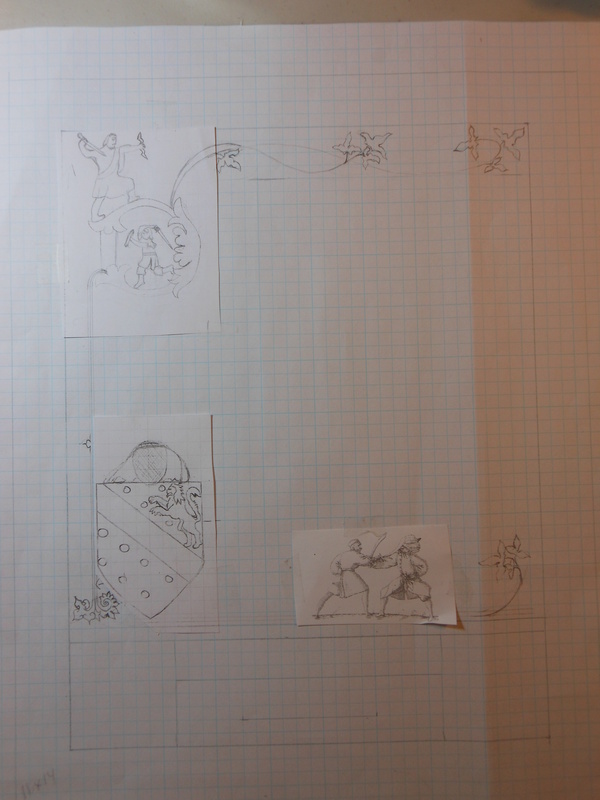 I used a lightbox to transfer most of the motifs, but noticed the two Turkish fighters were really in the wrong place and I had to erase them and move them over about 1/2 inch. A half-inch doesn’t seem like much and if I’d already starting painting the scroll I wouldn’t have bothered. But in the pencil stage there is still opportunity to make changes. Deciding to making a change at the pencil stage depends in large part on how hard making the change is and the impact on the final result. Something hard to redo that won’t make a big difference, probably isn’t worth the time and effort. Something easy that really shows should be changed. Everything in between needs to be considered. Sometimes, it’s good to put the whole thing down and take a break or not look at it at all until the next day. Sometimes you really need fresh eyes (and sometimes it’s good to get an objective outside opinion). After I transferred everything, I went back and free-handed some embellishment for areas where the lightbox really only gave me the outside lines. The next step is painting! 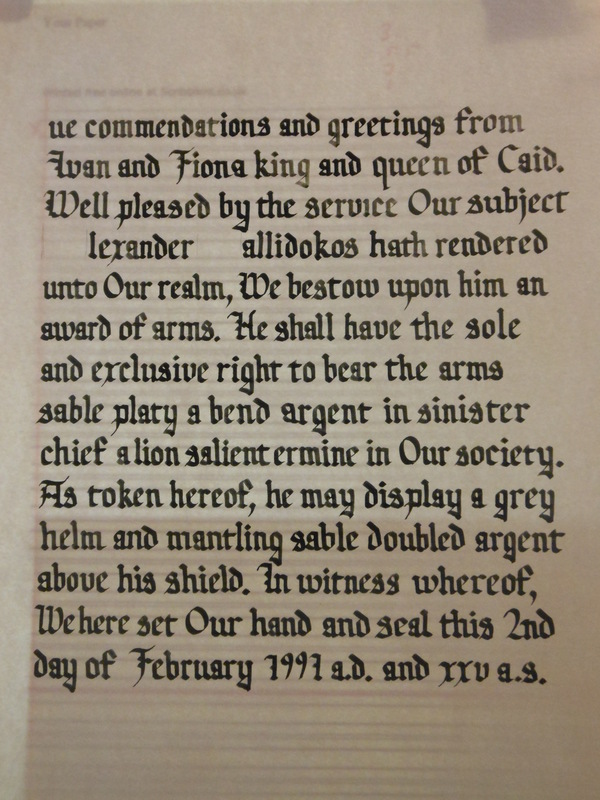 After that I practiced all the capital letters I needed in the scroll because I often have trouble with those. I taped a blank practice line sheet to the back of the scroll, measuring from the edges (which might not have been the best method but I guess it worked.) Then I started doing the calligraphy. Half way into the second line I realized I’d left the second g out of greetings and the v in Ivan was a u, so I started over again. 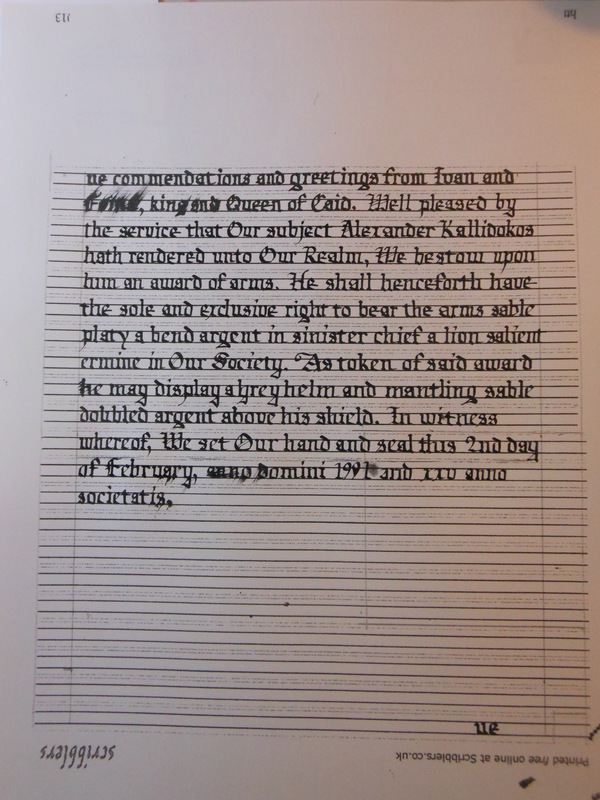 Last night at Kingdom Scriptorium, I practiced the text of Alexander’s scroll, using a larger calligraphy nib. It took up a little over one line too much. (And the smaller practice was about 4 lines short). I really want the calligraphy to fill the space left for it. So, tonight I redid my practice lines (from scribblers.co.uk) leaving less room between the lines and leaving everything else the same. I also chopped out a few extraneous words like henceforth and that. I wrote it all tonight in about 40 minutes I guess (I took several breaks). I’m pretty happy with it now. It all fits. A couple of lines need to be a little tighter (see where society and 2nd go over the line?) but that should be pretty easy to adjust and I have a little bit of slop room at the right edge. I need to practice some of the capital letters a few more times, but I think I’m pretty much ready to do this on the good paper. 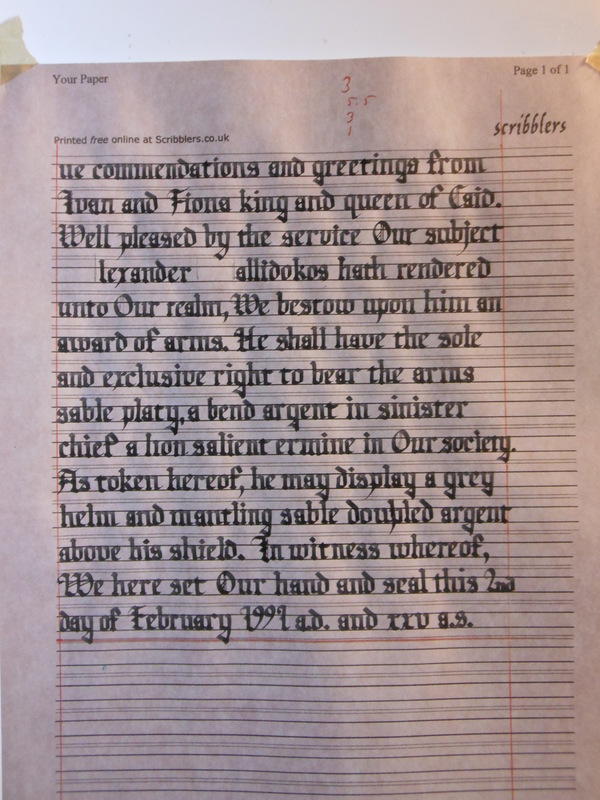 I did a quick (and sloppy) run through of the calligraphy for Alexander’s scroll. (You can see where I smeared my hand through the ink a couple of times. It wasn’t great paper to practice on and the ink wasn’t drying very fast.) It was supposed to give me an idea of where to end each line, but it turns out, the pen size I picked is way too small and there will be too much white space at the bottom of the scroll. I want it to come out with as little left over space as I can. 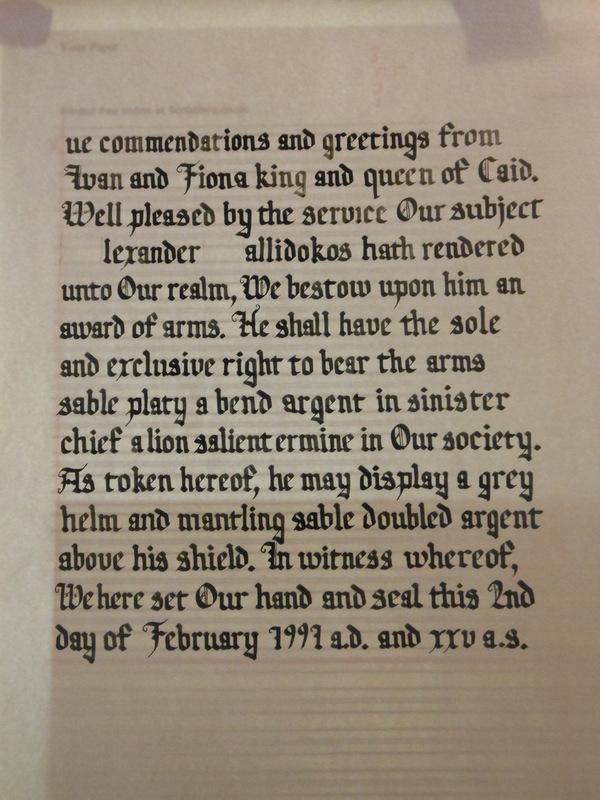 I want to go back and examine my source material for the calligraphy hand a bit more. I changed the “e” half way through and need to see if there are other letters I can use from the pages I have, that work with my basic blackletter hand. What I need to do next is find a bigger pen and figure out how far apart the lines should be with that size pen. Then I’ll run through the entire thing over again. 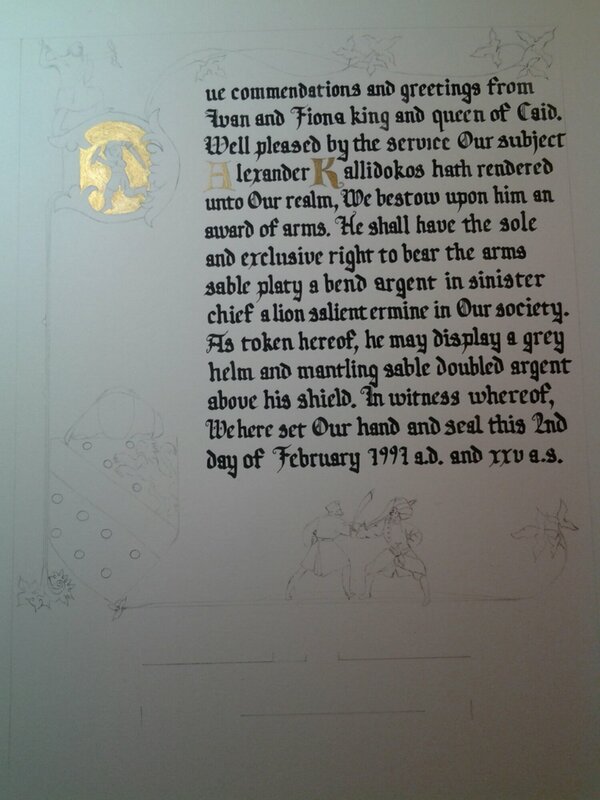 I’ve finished the layout for Alexander’s Award of Arms scroll. I added the scroll-y line across the top and the leaves. And a little bit of flourish along the bottom. Plus the Turkish fighters on the bottom. I had penciled in the capital letter with Zeus on top and the fighter in the middle, but then decided it needed to be closer to the top of the page, so I made a photocopy (and also reduced it about 5%) and then taped it into the spot that I wanted it in. Then I realized that the arms needed to be moved over, so I did the same thing. I could have erased everything and redrawn it, which I do sometimes, but making a photocopy and positioning it where I wanted, sped the whole process up quite a bit. The leaves took a bit of messing with and I’m not sure I’m 100% okay with them, but the leaves in the examples I’m following are fairly free-form, so maybe I’ll just move on. I have a six-inch by six and a half-inch space for the calligraphy. I’ve cut the words of the scroll down to a minimum and I’m hoping it will all fit.